Every 3rd Tuesday of the month 111 Minna here in San Francisco hosts Sketch Tuesdays where artists draw in front of you while you drink beer and leer over their shoulders. Completed drawings are pinned to a board for all to purchase inexpensively. 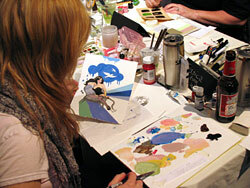 Some of SF's better known artists today have participated in previous sessions. Artists draw, you drink, then art's for sale. Ert checked out 111 Minna's monthly live drawing event. To 111 Minna for their monthly series featuring live sketching by bay area artists.